South African President Jacob Zuma has pressed for the mobilisation of resources for the African Capacity for Immediate Crisis (ACIRC) at the recently concluded African Union Summit in Malabo, Equatorial Guinea, even as terror and sectarian violence roils across the continent. “In order to respond to crises on the continent, the AU Summit took a decision last year to operationalise the African Capacity?for Immediate Response to Crises as an interim mechanism, until the African Standby Force is established,” Zuma said at the two-day summit of the 54-nation African Union (AU). ACIRC was expected to be launched by October. 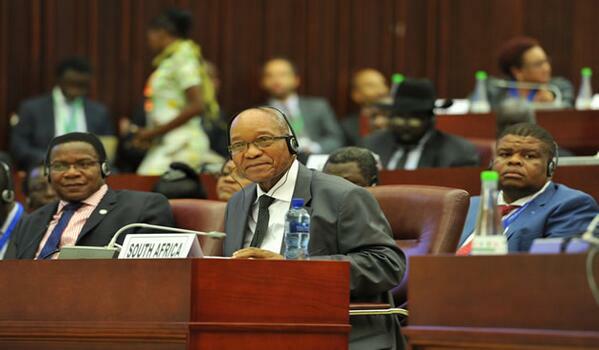 South Africa spearheaded deliberations at the 2013 AU summit, held in Ethiopia, for the adoption of the ACIRC. The ACIRC is seen as precursor to the AU’s African Standby Force (ASF). Plans for the ASF have been in place for over a decade and is expected to be operational by 2015. African states were forced to request French intervention to tackle crises last year in Mali and Central African Republic in the absence of the ASF. Zuma on Thursday said countries which had volunteered to contribute resources to the ACIRC met during the AU summit to discuss its state of readiness. “The African Union Commission concluded its verification visits to the contributing countries and presented a report on the framework for the operationalisation of the ACIRC, which was endorsed by the contributing countries,” said Zuma. Terror outfits like Boko Haram in Nigeria and Al Shabaab in Somalia and Kenya have disrupted peace in the continent as well as much as ethnic strife in Central African Republic (CAR) and South Sudan. African Union forces killed more than 80 suspected members of the al-Shabaab militia in southern Somalia earlier this week. Al-Shabaab has claimed responsibility the Westgate shopping mall attack in Kenya last September in which at least 67 people were killed and also for two separate attacks last week on the Kenyan coastal town of Mpeketoni that left at least 60 people dead. Dr. Malte Brosig, Senior Lecturer in International Relations at the University of the Witwatersrand in Johannesburg, says South Africa has witnessed a remarkable upward trend in foreign policy and security matters. “The Malian experience provided the final impetus for South Africa to promote the idea of an African intervention force. And with it the acceptance that in certain situations the use of force for peace is an acceptable means,” writes Brosig.